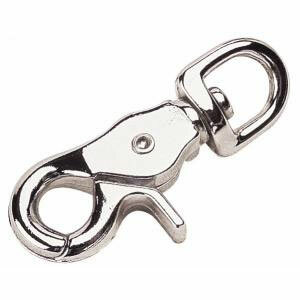 Small brass trigger scissor snap with swivel is ideal for cave and technical divers to use when clipping gear, e.g. for clipping your regulator on a D-ring. The trigger snap is easy to operate with gloves while the scissor action of the clip ensures safety lines etc. cannot mistakenly get caught in the clip.